Men’s bags have recently begun to emerge as a fashion statement. Thinking that bags are only accessories for women are a thing of the past. Bags do not discriminate among genders. They add a touch of chic and sophistication into a person’s everyday look. Each one of usneeds a bag to keep our belongings. While they are at it, it can be used to compliment and style their outfits. Since men’s bags are not all that common, here are seven types of bags that men can use on a regular basis without having to worry about looking like a fashion disaster. This casual bag can be carried without much difficulty by anyonefrom high school students to office goers. This classic messenger bag can make a statement without seeming too over-the-top or too old fashioned. It gives a classic look and goes with any outfit, for any occasion. As common as this may seem, a briefcase never goes out of style. It exudes a sophisticated look that a working-man can pull off any day. 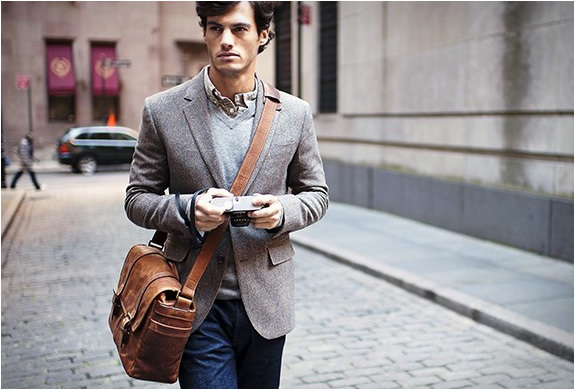 Briefcases are timeless and are now changing in designs to suit the modern office-goers fashion. Almost anything a man needs can be fit into the briefcases’ interior compartments. This bag is more compact than usual messenger bags. It can be used for casual outings and does not require much effort to don the vertical messenger bag, just sling it over your shoulder, and you are good to go! The more informal version of the messenger bag has chic written all over it. It holds with it a personality of its own that exudes elegance off a person who carries it. This trendy bag can help even the simplest of outfits to stand out with its modern pattern. Typically it would suit school going boys or teenagers who wish to make a bold statement with their bag. A tote bag is also a fairly new addition to a man’s modern bag/purse collection. It mixes masculinity with modernity perfectly to go along with any formal and casual attire. Tote bags are easy to carry around,and they add a touch of casualness to the otherwise formal look. This bag is great for informal occasions where the person goes for a relaxed look and does not need to worry about dressing up. The hobo bags speak of a unique style that is mostly found in the youth. It is a stylish, compact bag that suits all types of clothing. Backpacks for girls might sound old school, but they never go out of fashion. A backpack has many more benefits than just comfort. Attractive and new designs of backpacks for men are emerging to make backpacks a fashion statement again. They are not meant only for students to carry notebooks, a backpack has several uses and a stylish one never lets you down!